Full Disclosure: I have never met Joe Stange or Tim Webb. There were a few books I picked up before my European Beer Bible research trips to plan the precious few stops I could make in each country. The most difficult country in terms of selection was Belgium--there are just so many unusual, singular breweries there. 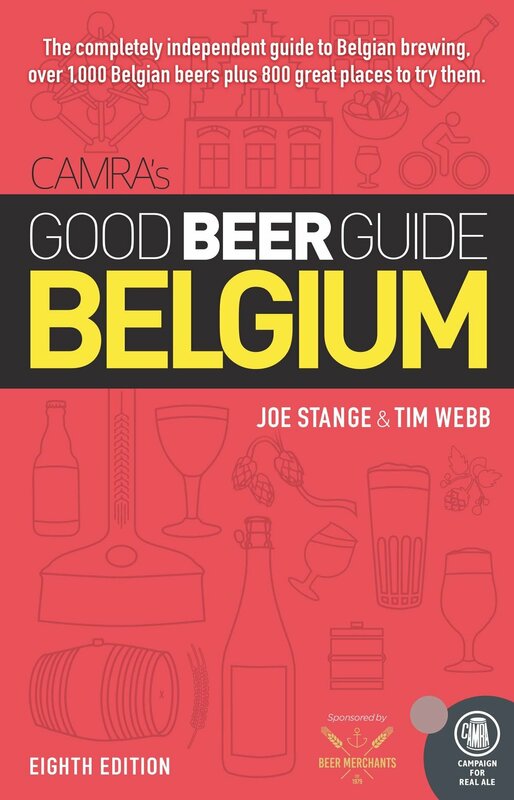 So I grabbed Good Beer Guide Belgium by Tim Webb, then in its sixth edition. It was a book Webb had been updating since the first edition came out in 1992. It was absolutely one of the best of its kind (which is to say guide book--on any topic—not beer book). Now that we have the internet, raw information is available everywhere. Happen to be in an unfamiliar part of the world and want to go to a brewery? Simply grab your phone, pull up Google maps, query it about breweries, and they appear before your eyes, each one rated by visitors. And if you want more, that's just a web search away. This ready availability of information belies the failing of all this raw info, though--it's unselective and in a real way, uninformed. Would you trust a random tourist from Ohio to tell you the best restaurants in New York? Why would we think online ratings are any better at interpreting something as complex and confusing as Belgian beer? Tim Webb is an engaging and funny writer, one with deep knowledge of his subject, and I could see he would direct me to the breweries I needed to see. The seventh edition of the book, which came out in 2014, had a notable change--the addition of Joe Stange as co-author. He's back for the eighth edition, along with a note from Webb announcing that this would be his last edition. This seems like quite a newsflash for a work Webb likens to his own child and admits "feels more like a religious text." I bet Stange gulped when he read that, and wonders how the inheritance will fare. Based on this edition, I'm not worried. Good Beer Guide Belgium is actually the opposite of a religious text. It's full of irreverence and opinion, and doesn't go in much for feigned objectivity or pretenses to authority. And in that way, it achieves both. This is what I loved about it the first time I read it. Belgium itself is treated with quasi-religious reverence by many Americans, and I confess I started out there, too. Webb and now Stange are great at keeping it real, though. As an example, take this comment on Du Bocq: "The house schtick is to spice beers with varying amounts of anise, coriander, ginger and orange peel." It immediately lets you know that just because a brewery has an exotic name, a history longer than most countries, and claims to baronial beer heritage does not mean you have to consider it accomplished. One of the great characters of the Belgian new wave, Dany Prignon, set up his ramshackle brewery in the Ardennes as a lark. A shy, modest creative type, his eccentricities extend as far as not especially liking beer. His brews divide opinion: their cartoonish whimsy and mystique are exactly what attract many to Belgian beer--they are certainly distinctive. On the other hand there is inconsistency through rogue yeast and misguided ingredients. Occasionally you open a bottle that reminds you what it's all about. You decide." "Alfons Cnudde bought the old Meheus farm brewery just north of Oudenaarde after World War I. Its last renovation was in 1953. The main beer is an old-fashioned, lactic–tart brown quaffer made by three brothers from the fourth generation of the family. They fire up the ancient copper kit several times per year, when the few cafés in the Eine that serve it start to run low. The beer is rarely seen outside Eine, where its nickname--kerkhofsap or, loosely, graveyard juice--comes from locals saying that the brewing water comes from below the cemetery across the street. The Roman brewery helps to keep things going as an act of cultural preservation." In the two editions since I last looked, a fair amount has changed in Belgium, including more consolidation, the emergence of new breweries, and lots of contract brewing. To make this clear, brewery entries are well marked. New breweries get a NEW. Corporate breweries are listed by acquired brewery and corporate owner, for example, "De Koninck (Duvel Moortgat)." Each brewery listing is incredibly economical, but packed with information. Accurate founding dates sit alongside size categories ("miniscule" to "sizeable"). Beyond the brewery entries are lots of information about the beer styles and history, and the bulk of the book is a typical travel guide, with listings by place that include maps, cafe recommendations, and brewery tips. The real value, though, is the exhaustive information about the breweries, which serves as the best repository of information about the country as well as a time capsule for what was happening the moment the edition went to press. It's a great book, and you'd be crazy to plan a trip to Belgium without picking up a copy. In reviewing the book, I reached out via email to Joe Stange to get some information I thought I might fold into this post. What he sent in response was so thoughtful I’m including it all. Jeff: How did you get the call to work with Tim on this? Joe Stange: It was way back in December 2011 that Tim invited me to join him as co-author. We had met in Northern France to drink bière de garde, eat potted meat and see some estaminets--me for an article in DRAFT, him just for fun. Tim was looking to take on the World Atlas of Beer with Stephen Beaumont and had decided that he needed someone to share the load on Belgium. We had already worked together on Around Brussels in 80 Beers--I wrote the first edition with Yvan De Baets, while Tim edited and published it. We found that we worked well together. We improve each other's jokes. Do you have a special connection to Belgium? My wife and I lived four years in Belgium, so that's how this all started. My professional background is in journalism, editing and news reporting, but finding that kind of work is tricky when you're a trailing spouse. Freelancing is not usually profitable but it's beautifully portable. I didn't set out to write about beer, but there were so many beers in Belgium that Kelly and I started taking notes and keeping scores, just so we could remember little brands and breweries. We became accidental experts in what we liked. We drove a crappy Ford Focus wagon all over the country to cafés and breweries on weekends, with a dog-eared, scribbled-up version of Good Beer Guide Belgium, that was the 5th edition. That was our bible, and I thought it was the greatest guidebook I'd ever owned--and I've owned a lot of guidebooks. Never thought I'd end up writing the damn thing. We have this transient lifestyle but Belgium feels more and more like home to me. I have friends there, my son was born there. The Guide is a convenient excuse to keep returning. Kelly still allows it. She is a great patroness of the arts. It is an interesting time, because the beer market is finally changing a bit in craft-resistant Belgium. I don't agree that Belgium is "craft-resistant." Small, independent breweries making a broad variety of styles--this never went away in Belgium, though there were a few tough decades of consolidation. The arrivals of breweries like Achouffe, De Dolle, Abbaye des Rocs--there was a wave around 1980, contemporary with Sierra Nevada. We might also think of Pierre Celis at Hoegaarden as an analogue to Fritz Maytag at Anchor Steam, early ambassadors for character and variety. In Jackson's World Guide to Beer, he used the phrase "craft-brewers" in his chapters on Belgium and France. I think he was translating "artisanal" into something that sounded less highfalutin. These days Belgian brewers are more interested in American- or international-style craft beer, but most of them still do it their own way. They like relatively expressive yeast and bottle conditioning. They like their multi-step mashes, Continental malts and greater "digestibility." They like their lush foam, their glassware, their presentation, and most of all they like balance. So while there are a few Belgian breweries imitating the samey West Coast IPAs, for example, you might understand why I find them annoying (even when they're good, as many are). Do you have any observations about the book’s role in 2018 versus what it might have been in 1988? The biggest difference between now and 1988 is the sheer number of breweries and brands. It's getting more difficult to track all of them and their beers. It used to be possible to taste and review them all, but not anymore. Still, we do our best. There are about 250 breweries now--but still tiny compared to the US, so manageable in a way. There are also a lot more beer-specialist cafés than there used to be, as more Belgians--like the rest of the world--take a greater interest in local and independent brewing. Meanwhile there are a lot of little "beer firms" that are not breweries at all, but they are happy for us to assume that they are. There are hundreds of different brands that come mostly from just a few contract breweries. They create an illusion of variety, in a way. So that's part of the Guide's role today: separating the fakers from the real brewers. Because we think that people like to know the difference. But a lot of good beer comes out of those contract breweries, so we try to be honest about that too. The book is full of opinions, which are really useful things if not taken as gospel. Tim's Guide has been funny and opinionated from the start, and I wouldn't want it to change. I can't promise it will be as funny without him though. The man is hilarious.